Open Interest is believed as a Confirming Indicator by numerous traders across the globe. It generally confirms the market trend (whether its rising, falling or sideways) when used in conjunction with other parameters like volume and price. It also measures the flow of money in the market. This article would introduce you to the concept of Open Interest, and also demonstrate Open Interest Analysis Excel for Option contracts. The Excel sheet is downloadable from the end of this article. Open Interest represents the number of outstanding contracts for Future and Option contracts. For Options, every strike price of Option contract has an individual Open Interest value. It can also be defined as the total number of Future or Option contracts that has not been squared off. Open Interest tends to zero value at the expiry day of derivatives market as every one squares off their open positions. To summarize, if both parties to the trade are initiating a new position ( one new buyer and one new seller), open interest will increase by one contract. If both traders are closing an existing or old position ( one old buyer and one old seller) open interest will decline by one contract. The third and final possibility is one old trader passing off his position to a new trader ( one old buyer sells to one new buyer). In this case the open interest will not change. This Excel sheet is designed to predict the Trend of each Option Strike of Nifty Futures. Please note that this is not our creation, as it is freely available in many online forums. We have just tried to make it more presentable so that even beginners can understand it. The Excel sheet attached with this post is for Nifty Options. It can be modified very easily for any other contract too. Step 1: Download the Excel sheet from the link provided at the end of this post. Step 2: Double click and open the downloaded file. It will throw some warnings for the first time. Click on OK. Step 3: Make sure you are connected to Internet. The Excel sheet will update every 5 minutes. Please download Open Interest Analysis Excel from the below link. Let us know in comments section if you have any queries. This sheet does not indicate any buy/sell signals. The purpose of this sheet is to find the overall trend of market based on Open Interest. In order to decide the buy or sell levels, focus on Call Net OI and Put Net OI columns. Check which Call option strike price has highest open interest and which put otion strike price has highest open interest. As of August 4th 2016, the highest Oi for put option is 8500. It means that market has a huge support at 8500 and will not break this level so easily. So we have to buy Nifty futures near this level or buy a call option near this level. As expected, on aug 5th, market opened gap up with 70 points and trading above 8600. so people who bought call option by following the above method would have gained substantially. As of today, 9000 call option has high open interest, so market has resistance at very higher level and we could expect the market to go near 9000 level in this expiry. @Admin: Sincerely admires ur knowledge & will to share it. Specially likes ur work on spreadsheets. If we meet someday, Beer will be on me! Cheers!! Do you provide any service? Hey Thanks for the sheet.. but it doesnt seem to update… shows the last upate as on 11th July 2016… could you email it to me please?Thanks in advance. The sheet should auto update. Do you see any warning message below menu bar saying ‘Enable Data Content’? Thank you so much for all the wonderful spreadsheets. Really useful. Thanks again Guys. 1 – As soon as we open the file, data in sheet “Data Nifty” gets updated automatically. Can you please share how we can to that ? 2 – Based on sheet “MAIN OI” can we also calculate Options Greeks ? thank u very much for this great work..the sheet is not updated..and i have to download again and again to see the latest time frame update of the sheet..please tell me how to enable auto update, thank you!! Hi Admin, indeed as compared to option chain, this is a wonderful template. Buy/Sell would need a lot more real-time info. I have a general observation (not regd.template) probably, many might be facing. Safe trading rules suggest to buy at day’s low and sell at day’s high. H & L can be decided based on daily volatility %. But, against our expectations, Before a buy order is placed, Offer Price keeps jumping up. After a buy order, it goes down. Before a sell order is placed, Bid Price keeps going down. After sell order, it goes up. Depending on whether market is bearish or bullish at the time of placing order, one can place buy order first OR sell order first. What could be the best strategy to resolve the ordering issue? Unfortunately retails traders do not have any workaround for this, as HFT algorithms manipulate prices very often. You should take this into consideration as slippage while devising your strategy. Hi, this worksheet is awesome. ¿Can you please explain how to use it for another ticker? Right now it works only for Nifty, we will update it soon for other scrips. #### means that the value is not fitting in the cell. Just drag the cell width to accommodate the value. Not updating 8100,8200,8300,8400,8500+ data in first sheet. Sir, could you help me to use this excel sheet for bank nifty….? Please, sir…. I am surprised how have I not seen such a magnificent website earlier……I applaud your work.. Happy Christmas to the entire team of this amazing website.I hope I will get bank nifty options open interest analysis excel sheet soon.Happy new year 2017 in advance. Sir, I thank you from the bottom of my heart.You are awesome……..This excel sheet is like a new year gift for me……..but bank nifty option analysis sheet is not showing any value……..I have posted my comments on related page too…..
Great excel sheet, download today and worked without any issue, good formatting. Small query – How to get Future open interest data ? Thanks Asha. 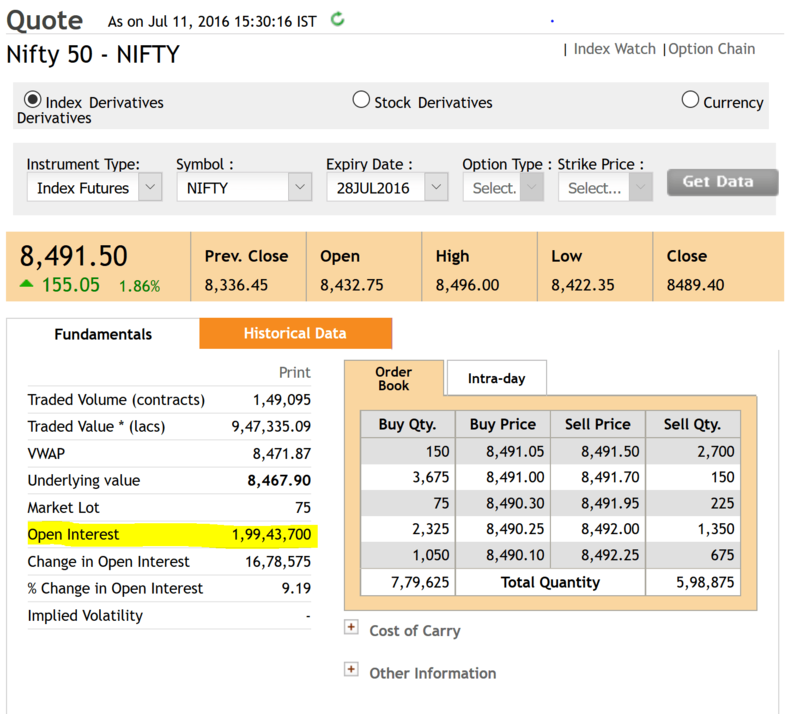 You may get Futures OI from NSE website. What change do I need to make for it to work for bank nifty? Sincerely admire ur knowledge & will to share it. Specially likes ur work on spreadsheets. Learning a lot from it as a beginner. Meet someday, treat will be on me! Cheers!! Hi. I downloaded the xl sheet and the data was for NIFTY for 11th July 2016. I was under the impression that I would get to see the data as of today ie 25 May 2017. Also, is there an xl sheet or any link to see such information for specific stocks.Thanks. In addition to my question, my other comment is that your grid specifying trends is incomplete. For example what is the trend if the price is rising, OI is up but volume is decreasing. This is not a hypothetical situation but is actually seen today in Axis bank scrip. Open Interest Excel sheet not working since 2/3 days. It gets updated by itself if you are connected to internet and Macros and enabled in your excel sheet. Thanks for the excel sheet. Its very good work. Do we have same sheet available for Nifty 50 Stocks? If yes please share. Its very good wowrk form your side. 1st thank you so much for sharing your precious knowledge to publicly ….i really appreciate work effort…God Bless you. Sir i just want to know this excel sheets…all excel sheets..
is it work on google spreadsheet…?? if yes then how to do that…? or can you make this excels sheets strategy in google spreadsheets as well…it will very big helpfull….plz ans me…ill wait for ur reply..
Can you provide this same sheet for individual stocks? Please guide me as to how can I trade with your excellent sheet in option market? Is it possible to use the spreadsheet to retreive US Crude Oil data? Currently this works only for NSE options. Thank you, Admin, for this sheet. It is very helpful. How to use this excel for other companies contract like reliance, ibulhsgfnce?? Right now it only supports Nifty and BNF. How to use this for other companies contract?? How to use this for options on other companies. Like HDFC Bank. Can anyone describe the excel, what is it that you are using, that is fetching data. I dont see any macro enabled. Please tell me, so that I can update it for other stocks as well. Thanks a lot . Your effort of simplifying the trading is amazing . A very good tool provided to trading community. keep it up. Can someone help me with this sheet to work for American options market ? does this mean both buy & SELL positions or only buy positions? u didnt mentioned about short selling? infact new positions may also be created due to short selling na!!! can i get it for commodity markets?? Currently this excel do not support commodity markets. I noticed that in datanifty sheet the A and B columns were not get being correctly calculated after the 89th row that’s why the Main OI sheet was not showing any data for most strike prices barring first 3. The error is solved by just dragging down the formula in A and B columns for rest of the cells. You may want to check up on this and fix it in the source script. Thanks for this wonderful tool by the way. Really appreciate it. This is a great insight for all the people who are not able to see correct values in the sheet. Thanks a lot! Great work… Can you also add functionality to provide stock options aswell. Please provide xls with selection of stock to provide stock option data. This request is alrready in our enhancement list. Will let you know once completed. Can we upload this excel on google spreadsheet and get the live data ? Actually I have tried after uploading excel on google sheet but not getting live data. Is there any way to do it than please help me out. Will it work in android phone phone’s excel sheet?? After download it is opening in smartphone excel but showing last update 06 jun 2017. Thank you very much Sir, for your great efforts and great kindness for sharing your work for free, I have just downloaded it, and will try to understand it first. However , I will have to learn how to use it to get Buy or Sell signals out of it.